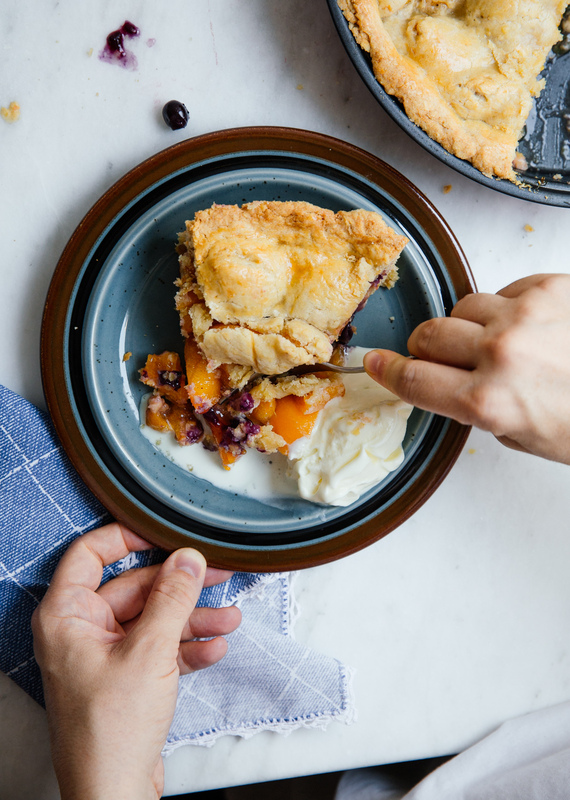 Buttery, crumbly, sweet and juicy, this apricot & blueberry pie is delicious on its own and even better with a big scoop of vanilla ice cream. 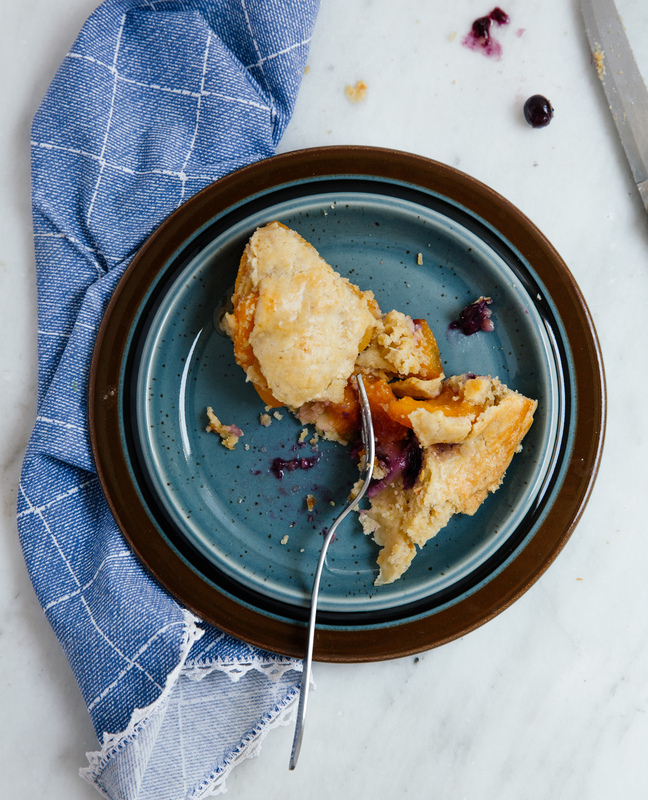 During colder months, apples and pears are my go to, both for a quick snack and for a pie. In the summer, I very happily switch to nectarines, peaches and mostly apricots. They may look less impressive than the two former, but I so love their soft flesh, sweet & slightly sour flavour! Plus they are just perfect for baking: tossed with some sugar and a little spice, when cooked they turn so sweet and sticky, they are just impossible to resist. This pie was made at my sister’s house, on an unbearably hot summer afternoon. Alkyoni loves desserts but rarely bakes- instead, she always welcomes me with a long list of things she’d like me to make for her. This summer, it was peanut butter brownies, a cheesecake, breakfast bars and a damn fine cherry pie. She announced her request as soon as I arrived and then started the negotiations: the brownies would be too much for the heat, the cheesecake is both our kryptonite so we would better stay away and breakfast bars are out the window for me when I go back home (instead, my breakfast usually consist of a variation of goods from bakeries). So it all came down to a pie. 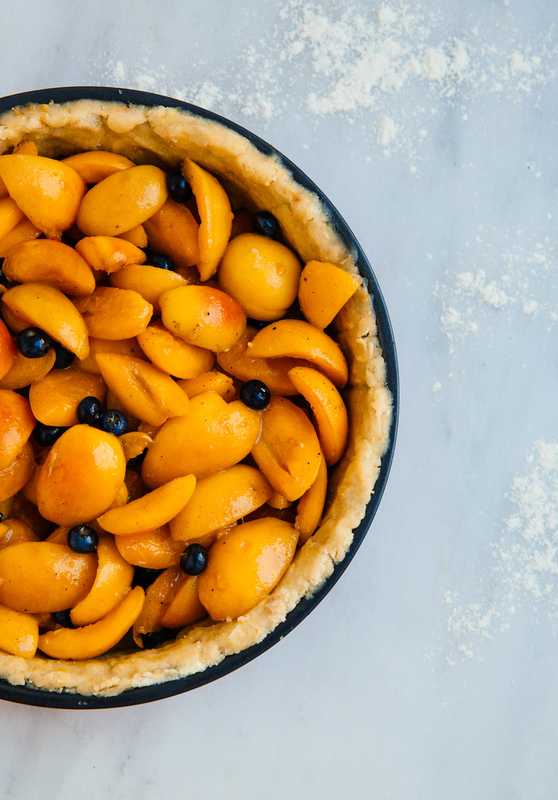 And since we are both always inclined to use what’s already on hand, we found our filling in the fridge: soft apricots and a big handful of sweet blueberries. 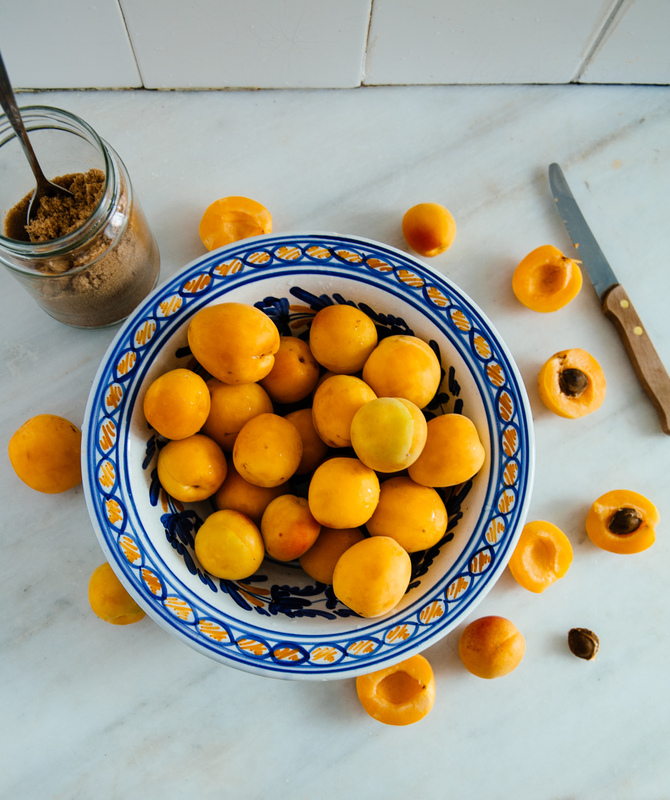 So on that unbearably hot summer afternoon, I set to make an apricot & blueberry pie, with lots of cinnamon and lemon zest; I decided to take photos too, as I love the marble tops in her kitchen and I’m forever a slave to Athenian light. 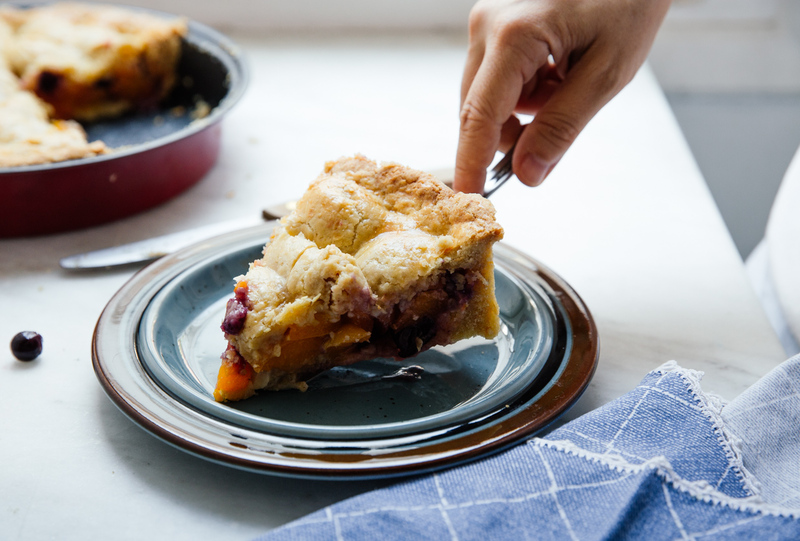 I was drenched in sweat, the dough almost melting in my hands, the fruit softening fast- all to make one of the best pies I’ve ever made, one of the best damn pies I’ve ever had. In a food processor or mixer, pulse the butter and sugar until combined. Add the lemon zest, egg and vanilla extract, pulse a couple more times and then add the flour and ground nuts. Fold together with a spatula until smooth; shape into a ball, core with cling film, flatten and place in the fridge for about half an hour. While the dough is the fridge toss together the fruit with the cinnamon, lemon juice, cornstarch and sugar. Preheat the oven to 180ºC (160ºC FAN). Half the dough and roll out to a 3mm thick. Lay on the baking dish, covering the sides too; spoon in the filling (leaving most of the liquids out) and cover with the second piece of dough, similarly rolled out. 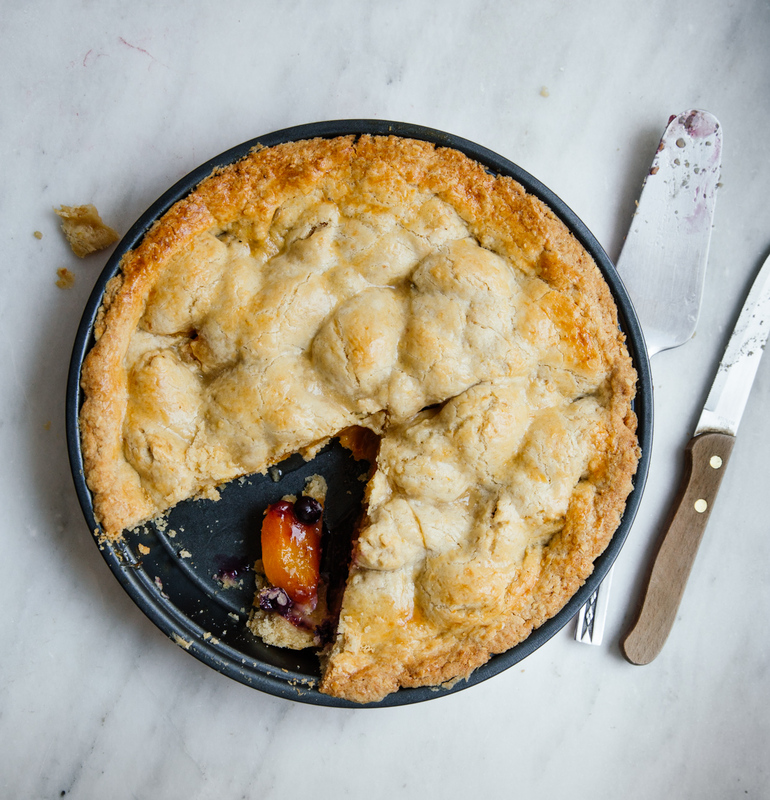 Score 4 slits in the middle of the pie, brush with the egg wash and sprinkle with caster sugar. Bake in the preheated oven for 45′, or until golden brown. Let it cool for at least an hour before serving (preferably with a big scoop of vanilla ice cream).